Are Enforced Updates a Good Idea? I currently have a system running Windows 98 in my home because there are some older games and other applications that I still enjoy using on that platform. The system isn’t connected to the Internet or any other machine because I consider the system a security hazard. I’ve set this system up for the sheer pleasure of seeing some of my old applications come to life again and to make use of some older hardware that still works just fine. The system has our movie database on it and a few other non-business items. However, the fact remains that this system would be unsafe to use to browse the Internet. It would probably be infected to the point of being unusable in a matter of hours (if it lasted that long). Generally, when it comes to my Internet-connected systems, I use the latest software available to keep my systems secure. The software isn’t allowed to languish until it reaches an unprotected state either. I test every available update on one machine. If it works and I don’t see any major problems, I deploy it to all of the other systems I own on the same day. One of the major ways to keep your systems safe is to ensure you’re running the latest version of the software—the one with all of the latest bug fixes. For most developers, debugging is an ongoing process. Although it seems is if it would be possible to squash every bug in the application after one carefully conducted review, the reality is that most applications are complex enough that even a team of developers can’t find every bug in multiple reviews, much less one. It also doesn’t help that many companies rush products to market long before they’re ready because they need to generate money from that product in order to remain solvent. So, from a certain perspective, we’re all beta testers and those bug updates are a requirement if we want to keep our systems running properly in the hostile environment of the Internet. products when those products are attached to an unfriendly Internet. Just in case you haven’t heard it, Microsoft is going to start automatically updating Internet Explorer users. However, Microsoft is hardly the first one to the party with enforced updates. A lot of other vendors use this tactic as well. Many products today include a forced update feature. Most allow the user to opt out of the forced update, but the default setup relies on forced updates to keep less skilled user’s machines updated. There are many advantages to using forced updates. The most important is that using forced updates keeps everyone on the Internet safer. The fewer machines that nefarious individuals can exploit, the better. Forced updates also reduce vendor support calls and could therefore help keep software costs lower. Using forced updates can also improve the user experience and make users more productive. For all these reasons, and more, I see forced updates as a big win for the less experienced user, especially the home user who is currently susceptible to every sort of virus and intrusion out there. However, there is a down side to using forced updates. All users find them intrusive. Even if the update is silent, it uses resources during the update process. As a result, the user’s system suddenly slows down, which could actually cause some number of support calls when the update process is a resource hog. Forced updates are also a cause for concern in corporate environments where running untested software can cause a host of interoperability problems with custom software. Expert users also find forced updates a problem because the update can (and usually will) cause problems with the user’s custom configuration. I’d also like to see forced updates provide a wait feature. Some users will apply unauthorized fixes to repair a bug until an update comes out. These unauthorized fixes tend to cause problems with the update. Giving the user a chance to remove the unauthorized fix before the update occurs will keep the update from actually trashing the user’s system. Personally, I never use these unauthorized fixes simply because they do have such a huge potential for causing more problems than they fix. However, some users don’t have the option to wait for the update to come out and must rely on an unauthorized fix. So, what is your opinion about forced updates? Are they a good idea? Generally, I see them as a win for novice and home users, but less helpful to corporate and expert users. Let me know your opinion at John@JohnMuellerBooks.com. A major problem with most applications today is that they lack useful comments. It’s impossible for anyone to truly understand how an application works unless the developer provides comments at the time the code is written. In fact, this issue extends to the developer. A month after someone writes an application, it’s possible to forget the important details about it. In fact, for some of us, the interval between writing and forgetting is even shorter. Writing good comments is a main topic in C# Design and Development as part of Chapter 13, but I make the topic part of every application development book I write. Despite my best efforts and those of many other authors, many online examples lack any comments whatsoever, making them nearly useless to anyone who lacks time to run the application through a debugger to discover how it works. Good application code comments help developers of all stripes in a number of ways. As a minimum, the comments you provide as part of your application code provides these benefits. Debugging: It’s easier to debug an application that has good comments because the comments help the person performing the debugging understand how the developer envisioned the application working. Updating: Anyone who has tried to update an application that lacks comments knows the pain of trying to figure out the best way to do it. Often, an update introduces new bugs because the person performing the update doesn’t understand how to interact with the original code. Documentation: Modern IDEs often provide a means of automatically generating application documentation based on the developer comments. Good comments significantly reduce the work required to create documentation and sometimes eliminate it altogether. Technique Description: You get a brainstorm in the middle of the night and try it in your code the next day. It works! Comments help you preserve the brainstorm that you won’t get back later no matter how hard you try. The technique you use today could also solve problems in future applications, but the technique may become unavailable unless you document it. Problem Resolution: Code often takes a circuitous route to accomplish a task because the direct path will result in failure. Unless you document your reasons for using a less direct route, an update could cause problems by removing the safeguards you’ve provided. Performance Tuning: Good comments help anyone tuning the application understand where performance changes could end up causing the application to run more slowly or not at all. A lot of performance improvements end up hurting the user, the data, or the application because the person tuning the application didn’t have proper comments for making the adjustments. I had previously mentioned the need for good comments. Some developers write comments that are nearly useless. Although it’s hard to encapsulate the substance of a good comment, developers who answer these sorts of questions are well on their way to writing good comments. Who is affected by the code? When is the code supposed to perform this task? Where does the code obtain resources needed to perform the task? Why did the developer use a particular technique to write the code? How does the code accomplish the task without causing problems with other applications or system resources? There are many other questions you could ask yourself, but these six questions are a good start. You won’t answer every question for every last piece of code in the application because sometimes a question isn’t pertinent. As you work through your code and gain experience, start writing down questions you find yourself asking. Good answers to aggravating questions produce superior comments. Whenever you pull your hair out trying to figure out someone’s code, especially your own, remember that a comment could have saved you time, frustration, and effort. What is your take on comments? Let me know at John@JohnMuellerBooks.com. Most application environments provide a means of setting command line arguments and CodeBlocks is no exception. The example shown in Listing 4-12 on page 107 of C++ All-In-One Desk Reference For Dummies requires that you set command line arguments in order to see anything but the barest output from the debugger. This post discusses the requirements for setting command line arguments for debugging purposes. Let’s begin with the example without any configuration. Every application has one command line argument—the path and application executable name. 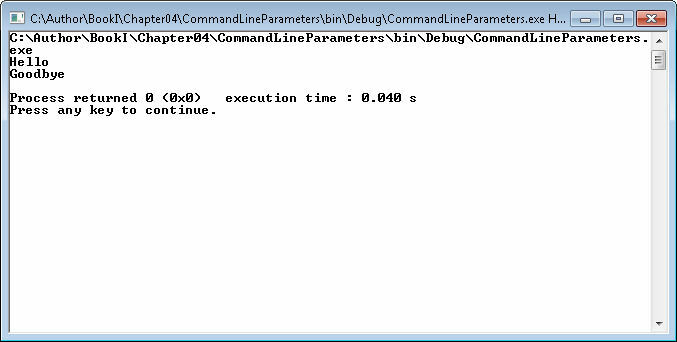 So, when you run the example shown in Listing 4-12 you’ll see the path and executable name as a minimum, as shown here. 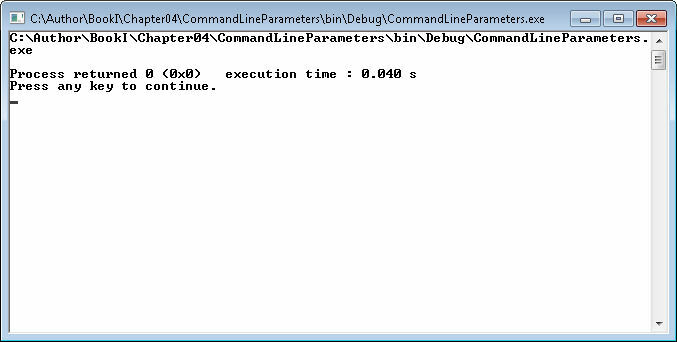 If you run this example, you may see a different path, but the command line executable should be the same. The point is that you see at least one argument as output. However, most people will want to test their applications using more than one argument. In order to do this, you must pass command line arguments to the application. The following steps tell how to perform this task. 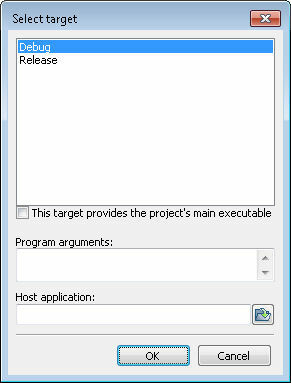 Choose Project | Set Program’s Arguments. You’ll see the Select Target dialog box shown here. 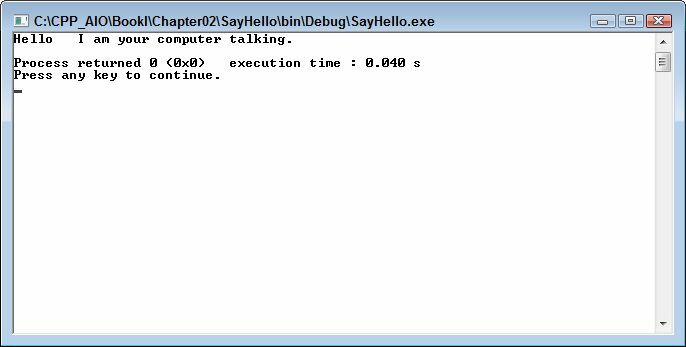 Select Debug as the target, as shown in the figure. 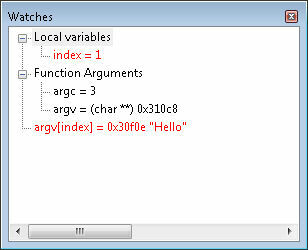 Type the arguments you want to use, such as Hello Goodbye, in the Program Arguments field and click OK. 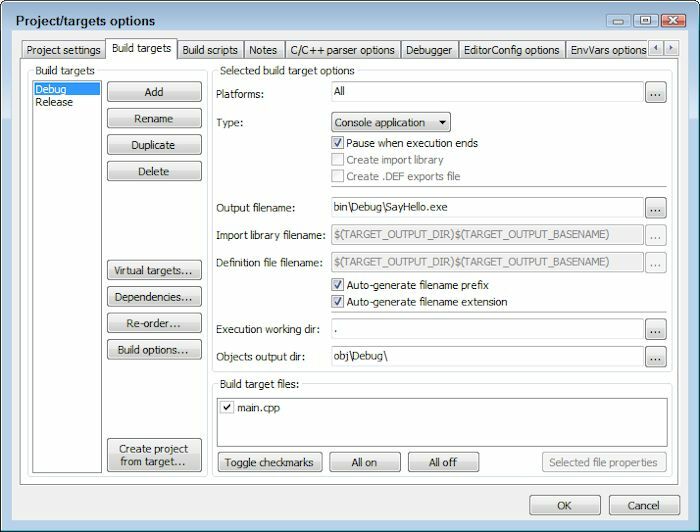 The IDE is now set to provide command line arguments to the application when you’re using the specified target, which is Debug in this case. You also want to create a watch that shows the command line arguments in action. In this case, you want to see the particular argument that the application is processing. Use these steps to set the watch. Choose Debug | Edit Watches. 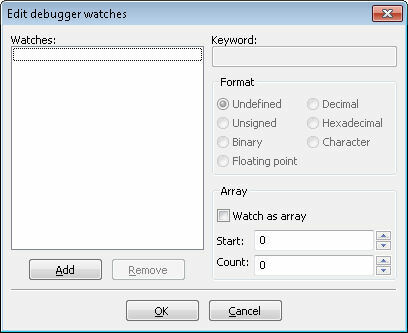 You’ll see the Edit Debugger Watches dialog box shown here. Click Add. You’ll see the Add Watch dialog box shown here. 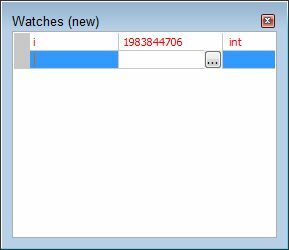 Type argv[index] and click OK. You’ll see the new watch added to the Edit Debugger Watches dialog box. Click OK. The new watch is ready for use. You’re ready to test out the new setup. Choose Debug | Start or press F8. The debugger will start. 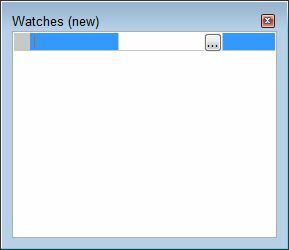 If you don’t see the Watches window, choose Debug | Debugging Windows | Watches. Click Next Line and you’ll see the first command line argument as shown here. Notice that the value of index is in red because it has changed to 0. In this case, argc contains 3 arguments (including the first one that you’re seeing now) and that argument is in argv, which is pointed to at the memory address shown. The argument at that first index value is the path and command line executable name, just as expected. Click Next Line twice. Now you’ll see the second argument, as shown here. If you followed the instructions earlier, you should be seeing Hello as the second argument as well. Click Run and you’ll see the output shown here. Testing for command line arguments in a CodeBlocks application consists of telling the IDE what to pass in the Select Target dialog box and then setting the correct watches so that you can see how the command line arguments work. Let me know if you have any questions about this process at John@JohnMuellerBooks.com.